I wanted something really traditional for my mother-in-law. 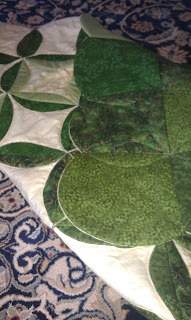 When I saw this post by Amy Gibson on Moda Bake Shop, I knew I wanted to do it in greens for her. This technique is easier than traditional quilting in some ways, and more difficult in other ways. 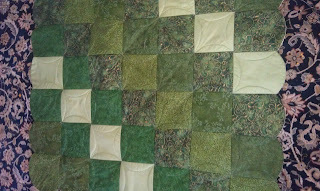 In this one, you START with the quilting. 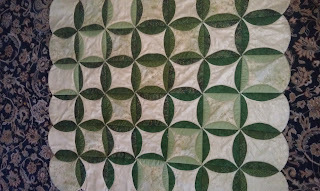 These circles are individually quilted with circles of batting, and then pieced together to create squares on the back of the quilt and cathedral windows on the front of the quilt. I love the technique; I think it looks so much harder than it really is. Amy's tutorial is descriptive and easy to follow. I had a ton of fun learning this quilt. I'm not gonna lie, though, quilting down these "petals" was not fun. Turns out I'm a lot better at straight lines than I am at curved lines. 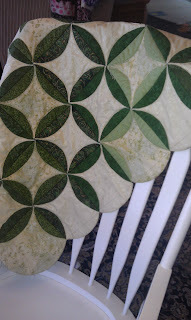 Feeding six layers through my machine while simultaneously turning the entire quilt at a consistent angle was rather difficult, but I persisted and this is the gorgeous result. There's no basting, no binding, and it uses a very different quilting method. It'll look great on her oversized cream-colored chair, and I think the style fits her perfectly. I agree, wholeheartedly, that it will look great on that chair and that the style fits me perfectly, as do the colors! 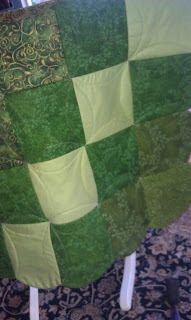 Thank you so much for such a thoughtful and lovely gift - I can't wait to see it in place, for all who visit to admire. 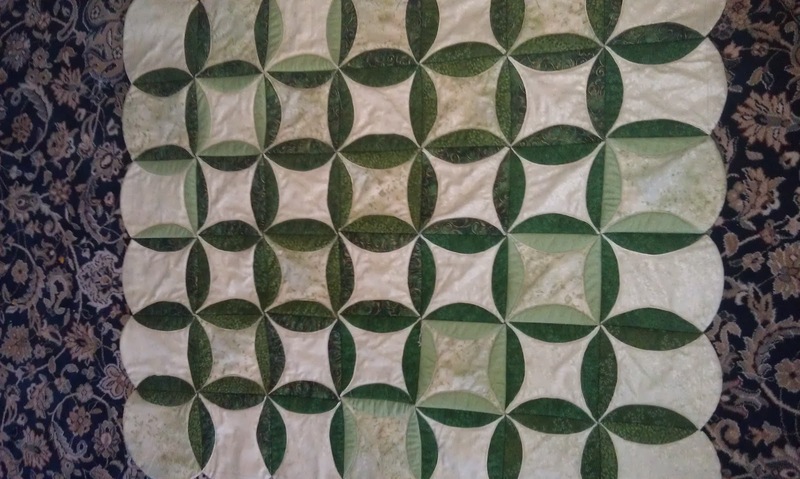 Plus, I got to introduce you to Quilting Adventures where we found the terrific material - makes the story of this quilt even more delightful.